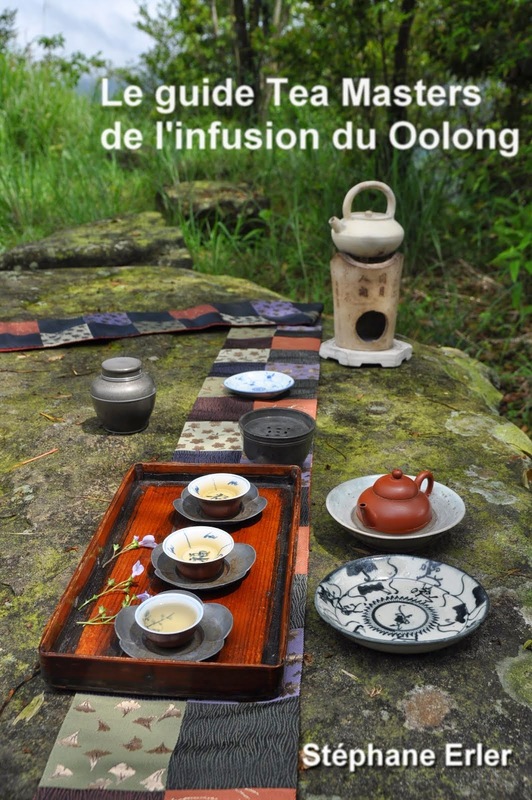 Drinking tea and focusing on this experience entirely can also be an exercise of creativity. Each time you drink tea, you feel differently and it's an opportunity to express your mood, hope, love with a special setup. It lets you connect to your inner self and it makes you feel good to combine tea and functional beauty. You can see from my blog that there are rarely 2 Chaxi (2 setups) that are the same. In recent weeks, they have tended to become very beautiful (thanks to the use of kimono belts and the great tea ware I've collected over 10 years). I'm a little bit worried that instead of inspiring you to do follow this direction, you feel it's not possible with the few tea wares you have. Most probably don't have a Chabu. That's why I have created this simple Chaxi with very simple accessories. 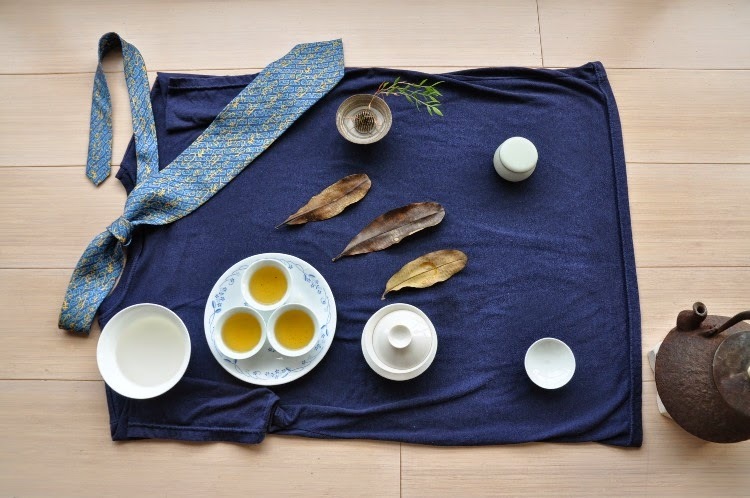 The Chabu, the tea cloth, I use below my accessories is simply a dark blue T-shirt! In a second step, I added a tie to give it a more artsy touch. 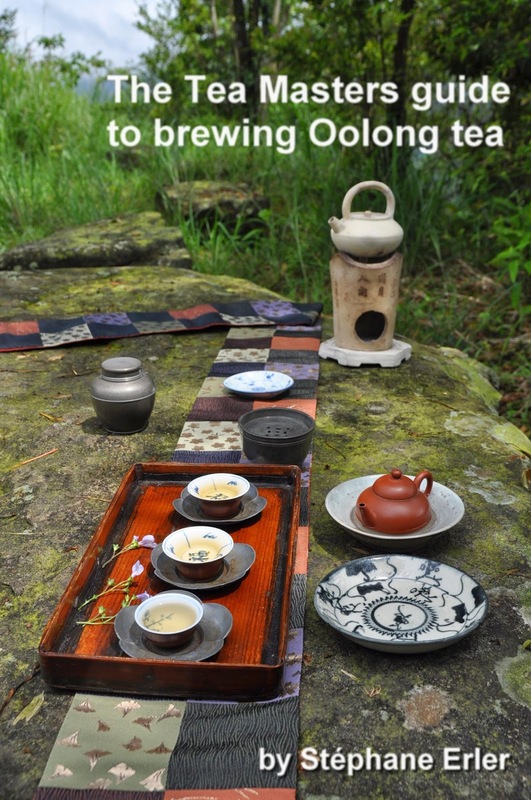 I'm brewing my 'strong' Hung Shui Oolong from Shan Lin Xi in a tall ivory gaiwan. It's the only brewing tool I used for my first years of tea study. 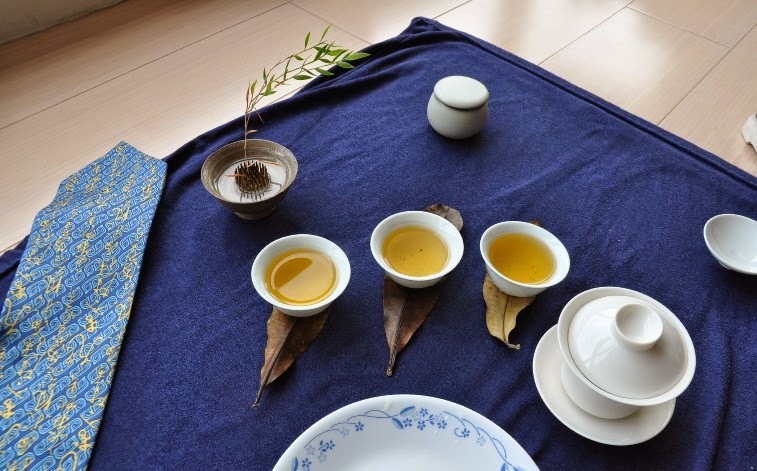 It can be emptied in these 3 classic light celadon cups, respecting the Chaozhou gongfu cha rule. - The waste water is a rice bowl. - The porcelain plate under the cups is a small plate for cookies/cake. 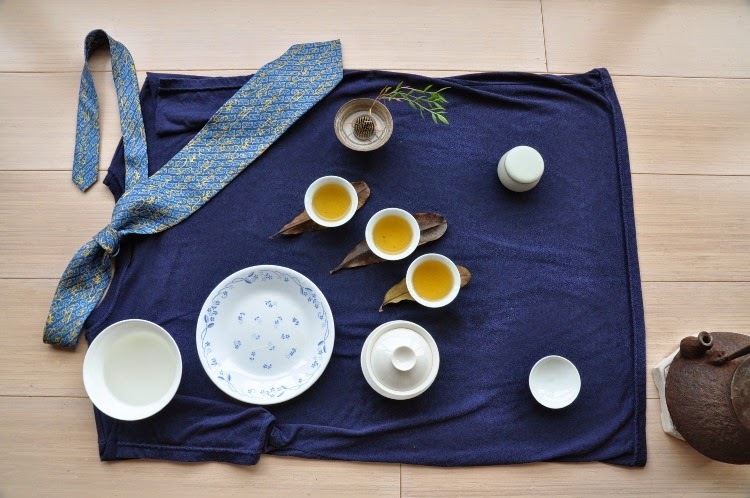 - The dry tea display plate is the cover of another gaiwan. - The vase is actually a pottery cup and I'm just using 1 branch of bamboo. - There's a simple celadon jar, but you could also do without. 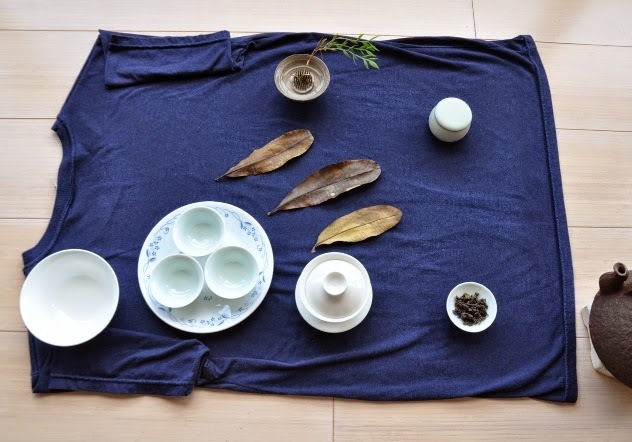 - My tetsubin is still in the picture, but you could place your kettle a little bit more on the side if it doesn't fit with the rest of your items. - My Cha Tuo are 3 dry fallen leaves. 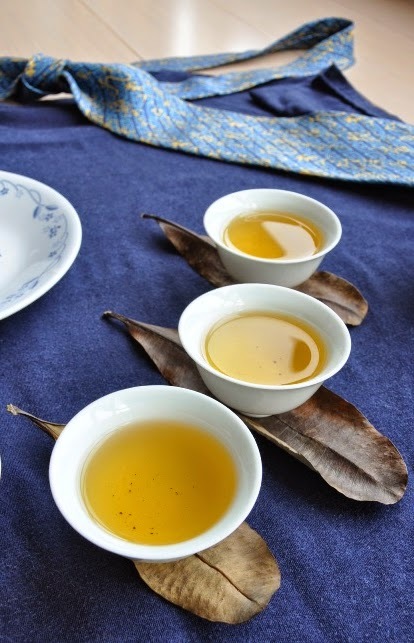 One of the functions of the Cha Tuo is to prevent tea stains. That's the case here. Cha Tuo come in many shapes. Very often, it's like petals and it makes the cup look like a flower. But there are also some that look like leaves and that gave me the idea to use actual leaves! The tea tastes so deep and complex, refined and powerful. 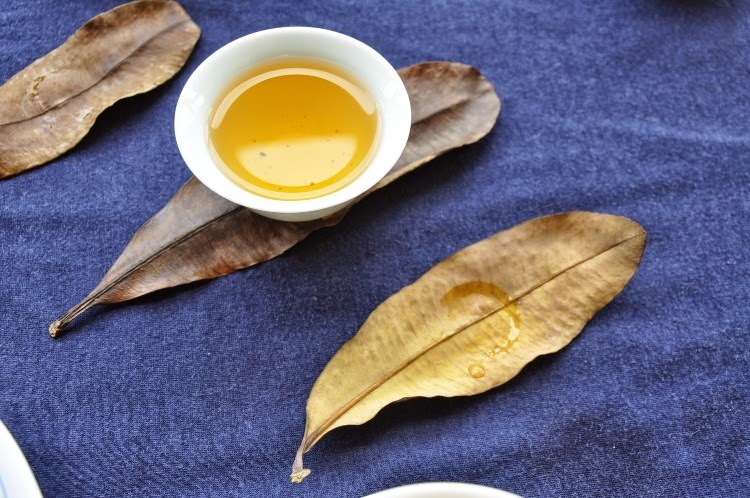 The leaves open up nicely in the gaiwan. This setup makes it possible to focus completely on the process of brewing and enjoying the tea. 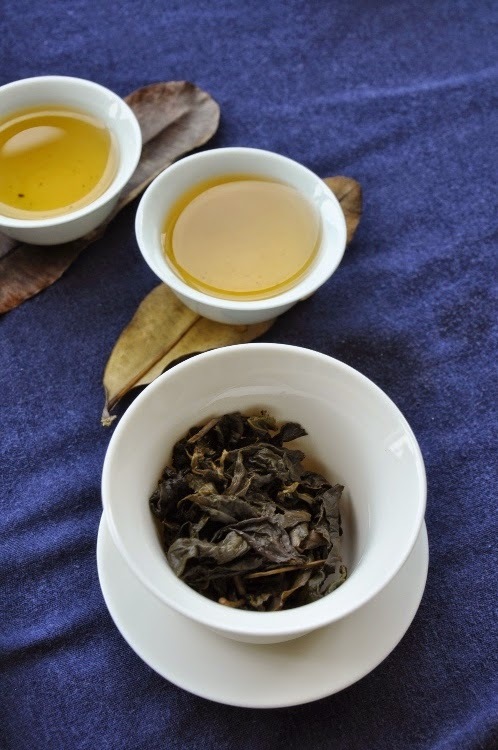 Such great tea leaves love this level of attention. They reward the effort and creativity with pleasures that go beyond tea and come close to an art performance. Tea is for everybody. Let tea inspire your creativity and sense of beauty! Beautiful, Stéphane! What a great reminder about the spirit of Chaxi. Thank you Payton. In Taiwan, very few trees loose their leaves. You can find much nicer leaves in America and Europe! That might be called a Tea-shirt, I guess. Great idea! Very nice! I especially liked the leaves to hold the cups.